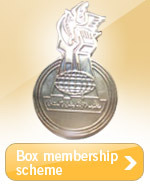 Eid Gifts For The Families of the Beloved Martyrs - PLEASE JOIN HANDS. Once again the Holy month of Ramazan is approaching -the month that Allah SWT has called His own and the month that brings glad tidings of salvation and blessings for all the beings. It is also a month of Eesar and sacrifice. The state of fasting enables us to think and feel the pain and misery of poor ,the under-privieleged and those who have to starve due to unavailability of resources. Besides its a perfect occassion to honour the sacrifices of your loved ones and increase your moral bonds with the near and dear ones . As a faithful our greatest responsibility is to pay tribute and present our humblest and heartiest gifts , to the most exalted collective benefactors of our society ,the beloved martyrs and their dignified families. 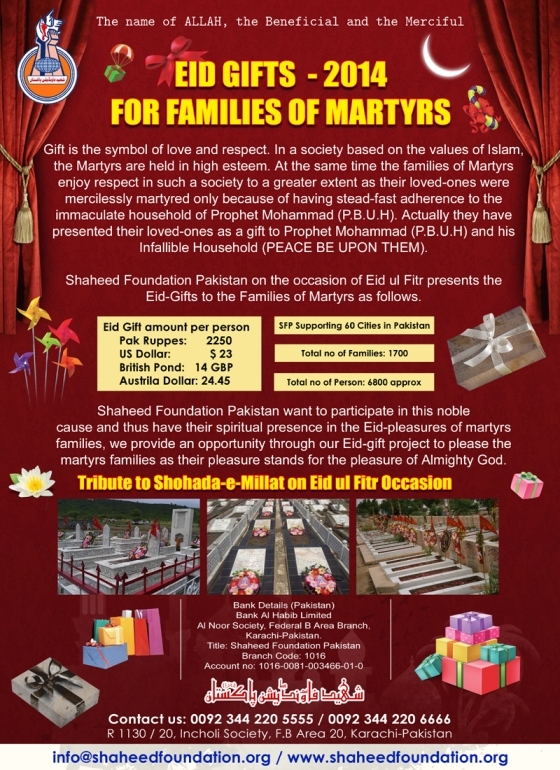 Each year Shaheed Foundation Pakistan arranges for Eid Gifts distribution for the Shohada`s families for bringing joy to the dignified families of our benefactors and mohsineen-e-millat. We must never forget that it is because of these beloved martyrs and the sacrifices offered by their noble families that we are able to take the name of Allaah and Masoomeen [Alaihimussalam] ,otherwise the enemy would have pushed us into non-existence . It is because of these martyrs that today we have a pride in proclaiming our allegiance to Ahlul Bayt [AS] and the Imam of our time . So it is very very necessary that on every occassion we must involve and humbly remember these beloved martyrs and their glorified families while rejoicing any occassion. This year the allocated per person amount for Eid Gift Project has been increased. Besides the number of families of martyrs have increased significantly, from 1504 last year to 1706 as of now .